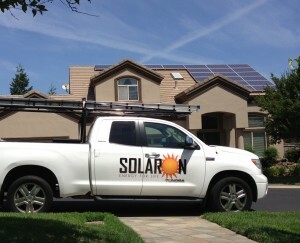 Solaron is one of Northern California’s best solar power contractors. Why do we believe that? First, Solaron is an Authorized Dealer for SunPower, an international solar panel manufacturer based right here in Northern California. This key agreement guarantees that our property owners in Dixon get what the industry considers the best solar panels on the market. Second, with more than 4,000 installations, Solaron has the important experience and the satisfied customer base to show that our team gets the job done right so you can immediately begin gaining the advantages of free power from sunlight, for electricity and heating. If you’ve decided that solar power is right for you, it is time to find a contractor in Dixon that can match your vision for quality and efficiency. Solaron is that contractor! Save money, spare the air, and be a part of the effort to change the future of our planet. Solar power brings advantages both economic and environmental. Learn more from a Solaron sales rep! Turn up the temperature with solar pool heating! The sun already heats your pool in summer, but a heating system from Heliocoil makes sunlight work even in the colder temperatures of spring and fall. Have the temperatures you want, whenever you want, for longer throughout the year. This enhances the entertainment and fitness value of your swimming pool investment.